Mason Trenching is a bonded, licensed, master plumbing contractor and carries over 4 million dollars in insurance. We have been in business for over thirty years and have successfully completed projects as small as changing a residential faucet to as large as replacing Monroe Community Hospitals (prime contract) 6" &8" ductile iron water main, hydrants, RPZs, and 4" copper supplies to and through all of their buildings while maintaining water to the hospital at all times. We are experienced in building jacking, rigging and moving of buildings including complete renovations. We were the contractor who supported, restored and replaced foundations, sidewalks, parking lots, and framing for the Rochester Institute of Technology when their foundations collapsed from ground water in three of their dormitories. We also installed 32 gas furnaces and built the utility rooms in other dormitories. We jacked, leveled and replaced all the structural beams &joists &new footing drains for the Town of Brighton in one of their buildings that had failed from ground water. In Nov. 2000, we successfully relocated a 2500 sq. ft. Victorian house (in one piece) back 500 ft. and up a hill with a grade change of over 60 ft. next to Mendon Ponds Park! Sept. 2003, we safely moved a 4500 sq. 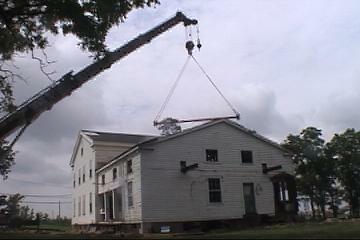 ft. historic 1830 Greece Revival house (in five pieces) 14 miles and broke the NYSDOT record for the widest load ever on State Roads in Monroe County. Having completed sewers for Groveland Prison (prime contractor) finishing both on time &under engineer's estimate, we were invited to be listed with the emergency contractors for NYS projects. We also completed approximately 1 mile of 15" storm sewers, manholes, catch basins, sidewalks and bridgework on Route 64 (Mendon Road) for the Town of Pittsford and the State of New York (prime contractor). We are registered with the Monroe County Health Department. We installed one of the largest private raised fill septic systems in Brighton, which was approved in a flood plain. We are a distributor for Clearstream Wastewater Systems, Inc. These certified sewage treatment plants can process as little as 500 to 1,000,000 gallons per day. One difficult, commercial plant was successfully installed in bedrock with a pump station & sand bed. Our treatment systems are so clean they have even received government approvals to release treated water directly into storm sewers or streams! We are bonded and our employees have received clearance to work in secured areas including banks, Monroe County Airport, NYS Correctional facilities and businesses requiring nondisclosure contracts. We were involved with the remodeling &mechanicals of the airport and with the FAA installing detection towers in Monroe County. We built the complete, and at the time highly confidential, facility for Trimatec Inc. and Eastman Kodak including the complete fabrication of the first of its kind nickel sleeve machinery working under the direction of the inventor &developer of the Xerox nickel drum. 1 yr. later, we did the expansion. Retail store work includes the Nov. 2002 opening of Breathe Yoga and Juice Bar in the Village of Pittsford, 2004 &2005 expansions. We have completed a number of historical (1800s) residential renovations including the 1st Supervisor to the Town of Brighton's 1812 Federal home. 2004 Factory trained by Generac, Inc. Fully automatic line of generators. These natural gas, propane, diesel, or multi-fuel 6 KW to 3000 KW units will provide the emergency power for our pump stations &Clearstream treatment plants, as well as, for automatic standby power for homes &businesses. 2005 Factory authorized &trained Phill natural gas, residential refueling pump installer for Fuelmaker Corp. &Honda Motor Company's new Honda GX natural gas vehicle. These pumps allow normal low pressure gas to be compressed and safely installed in natural gas vehicles in the comfort of your own garage. We own our equipment and are always interested in new ways to solve problems having never been limited to standard solutions. An example of this is the nine ways we can install water/ sewer services: (1) Backhoe - open cut, (2) Electric-hydro drilling machine, (3) Horizontal, air powered, pipe pushing/pulling machine (4) Air drilling including rock drilling (5) Electric/air powered pipe driving (6) Hydraulic, pipe ramming machine (7) Air powered, pipe bursting machine - used to replace a pipeline that has good alignment, but has failed because of leakage, (8) 400 pound steel air missile - Russian technology that can be launched underground from a basement to the street (9) Pipe - expoxy sleeving. We have offer wide range of professional building experience and enjoy working on challenging projects of all kinds.